When taking a job, one of the main concerns is (unfortunately) always about money- will I get paid enough and/or will I charge the right amount? It’s a difficult question that both project managers and freelancers face. To begin with, you should ask yourself what the price of any job you do consists of. It should incorporate your costs (material and time) as well as your profits. We will now focus on the projects for which time is the main resource, while material makes up just a part of the total cost. So how should we price the project? There are 2 ways how to do that, although I will try to show you that in the end, they should be the same. This is pretty straightforward. You work for a client and get paid 100 USD for every 60 minutes you spend doing the job. The more time it takes you, the more the client pays you. This could be quite nice for you, as you have all possible costs covered with your hourly rate, but maybe not so nice for the clients, who are looking for the final price in advance. This is why we recommend you to always have a well-written contract, realistic estimates, and most of all – trust in yourself and of course in the client. This second way is also pretty easy to grasp; your client needs some job done and he will pay you 1000 USD for that. You do the job, you get the money. The clients are happy, but what about you? Even if the price looks good, you should still be worried that there could be unexpected problems, such as your client wanting to do hundreds of corrections. This will cost you more time and therefore you will reduce your profit. Of course, this depends how accurate your estimates are, so we recommend you to use realistic estimates and again, a written contract which also leaves space for these unexpected situations. Both recommendations sound familiar? No wonder. A good relationship and communication with your client ensures that everything works fine and for the instances where this is not the case, you have the contract as your guide and guardian. And what about the estimates? In the end, everything revolves around one crucial question: "How long will it take?" For the hourly rate, the client asks this question to know the total price of the project. For the fixed price, you should be the one asking the question to see if it makes sense, money-wise, to do this project. But the question is still the same. 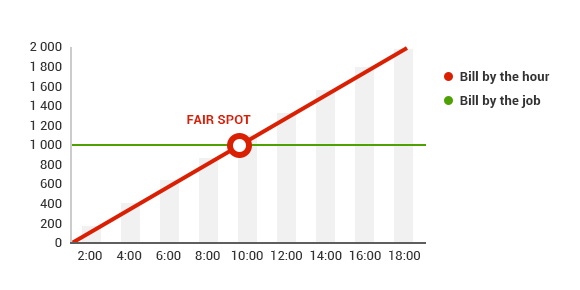 If you manage to answer it accurately, both the hourly and fixed pricing becomes one and you will be able to stay comfortably within the fair price area. Yes, but how do I make accurate estimates?